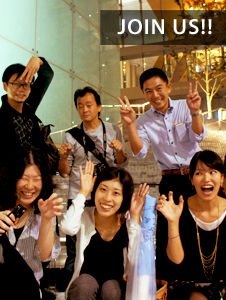 Roppongi has many faces including, an entertainment district with a foreign twist, new offices for daily business, and is developing as a center for the Tokyo art scene. The Lighting Detectives sped around on their bikes in April to discover what kind of light exists in this multi-functional area. 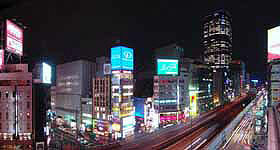 The presence of the entertainment district is strongly felt at Roppongi intersection. Most people recognize this intersection as the center of Roppongi, but in recent years new development has created two new areas of focus, leaving the center of Roppongi very ambiguous. Points of reference include Mori Tower, Midtown Tower, Tokyo Tower and the metropolitan expressway, that cuts through, dividing this area of Tokyo. Large-scale luminous signage and a collage of other miscellaneous lighting dominate the view. 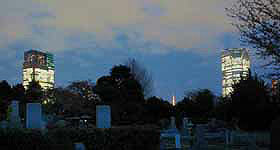 Looking toward Roppongi from Aoyama Cemetery. 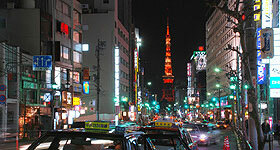 The 3 towers that stand pronounced over Roppongi are a product of power and force, but appear alien in this setting. The towers look close and, yet, far off, as this scene can play tricks on your eyes. Candle Night Summer Solstice 2005: Omotesando Debut!